Michelle Dede will be on the screen again, but this time it will be with Michelle Ashionye. It will be Michelle vs Michelle. Thankfully, the upcoming Africa Magic show E.V.E will put Dede back on the cable television landscape, meaning bigger audience and potentially bigger reception and big bucks at the box office. The teaser for E.V.E, which I have watched three times though, doesn’t strongly sell the show. One particular scene wherein someone’s bludgeoned by a sizably small object reminds me of ABC’s How To Get Away With Murder, and the mention of “murder weapon” just makes me draw more parallels. The show’s logline is the Latin maxim Audi Alteram Partem, which is the principle that no person should be judged without a fair hearing. It might be too early to say we are experiencing a boom of legal shows, given that we just saw video-on-demand service EbonyLife ON release Castle vs Castle, with bewigged lawyers strutting in a promotional clip. What’s with lawyers and wigs? It should sent be back to 1906. E.V.E has been in the pipeline since May, and now it’s here. 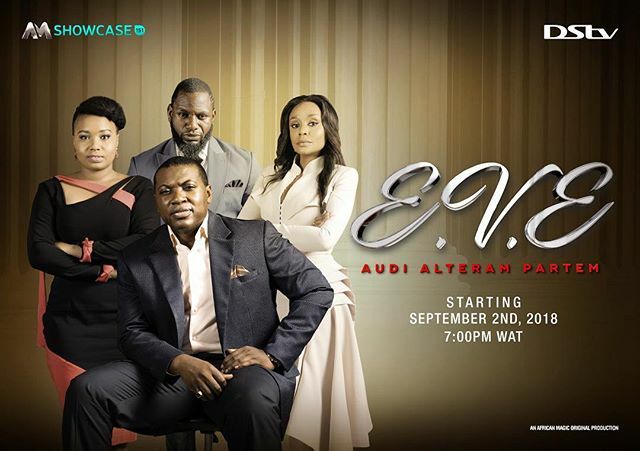 Starring Amstel Malta Box Office alum OC Ukeje and Jimmy Odukoya, who is up for Best Actor in this year’s AMVCA, E.V.E will premiere on Africa Magic Showcase, channel 151 on DStv, 7pm (WAT) on September 2nd.